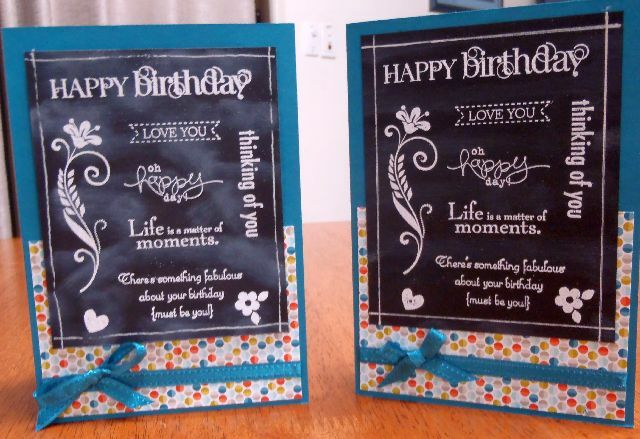 Make a black magic card (also called a chalkboard card) to create a dramatic tone for your next handmade greeting card. I made this sample up to show at one Brisbane Papercraft Expo and now I can share it with you. First, ink up your stamps with the white Craft ink and stamp them onto the dark cardstock. This creates a light background for your chalks to 'pop' off the page. Before the ink dries, use the chalk applicators to colour the images the way you want them. Apply the lighter colours first. For example, I added the yellow flower centres first then swept the darker colour of the petals and stems in toward the centre. Use the chalk eraser that comes in the kit of Pastels to remove any chalk that winds up outside the image you are colouring, but I find being too perfect isn't necessary as some smudging adds to the charm. This is a personal choice for you to make, of course. Add more colour till you are happy with the result. Allow the ink to dry naturally or help it along with a heat tool after it has been coloured to your satisfaction. Now use your image to finish your Black Magic card. The degree of smudging you use all depends on the effect you want to create for your own project. Isn't it great that we have so many choices when it comes to being creative? Now go forth and create a blackboard card of your own!